Irving Pump Up The Fun Summer Giveaway 2017: Win Up To $100,000! Visit IrvingFun.com if you are you ready to have some Irving fun! 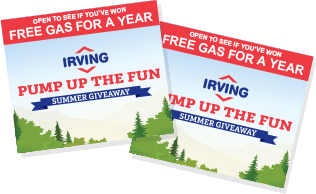 This Summer, pump up the fun at Irving Oil gas stations and grab your Irving Pump Up The Fun Stickers. You could win up to $100,000. Plus, be sure to look for the PIN printed on each game piece then enter the online Sweepstakes at www.irvingfun.com. The more PIN’s you enter, the better your chance to win. Irving Oil is giving away over $5 million in prizes and saving offers, all summer long. Will you be lucky enough to find rare Irving Pump Up The Fun stickers that enable you to complete a winning combination? There’s only one way to find out. Beginning on June 19th, you are encouraged to fuel up at any of the 763 participating Irving Oil and Irving Big Stop locations in Canada and the United States. You will receive a Pump Up The Fun Sticker Game Piece with every qualifying purchase consisting of Irving Oil fuel purchase or purchase made in the associated convenience store until September 5, 2017. Don’t forget to pick up a collector card before you leave or download and print the digital card available at IrvingFun.com. When you open your game tickets, you will find 3 Pump Up The Fun stickers inside that are used to play the “Collect To Win” portion of the Game along with an Instant Win message or a PIN used to enter the Online Sweepstakes at IrvingFun.com. Once you teared open your game piece, apply stickers found inside to your collector card and collect all the stickers in a prize category to win the prize associated with the category. All game tickets contain 3 Collect to Win stickers. Once you’ve collected all the stickers in a prize category, you can visit a participating Irving Oil location to get your “Collect-To-Win Submission Kit” to redeem your prize. Prizes include $100,000 cash, Ford F150 XLT, a Camping Trailer, $5,000 Cash, Free Gas for a Year, a GoPro Hero Session, a Happy Camper Package, and Irving Gift Cards. If you have duplicate Collect-To-Win stickers, collect and apply any eight duplicate stickers to the S’more Fun Giveaway category and mail in for a chance to win a $5,000 vacation getaway. You can download the Giveaway entry form at IrvingFun.com or IrvingFun.ca. Select game pieces will reveal a message stating “You’ve Won!” followed by the description of your instant prizes ranging from free products and saving offers to Irving Rewards and cash. 1 in 8 wins. A total of 9,018,000 of game tickets are available for distribution for the USA while 16,794,000 game tickets are available for distribution in Canada. Select game pieces will include a unique PIN to enter the Online Sweepstakes at www.irvingfun.com. Each PIN can only be used one time so keep fueling at Irving this Summer for more chances to win. You can also earn additional entries into the Sweepstakes by playing the Daily Online Bonus Game. Discover enough Bonus Fun Game Points and automatically receive one bonus entry. 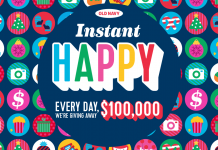 There will be a total 98 daily prize winners, one per day, who will each receive a $100 Irving Gift Card and up to 6 monthly prize winners, two per month, who will score free gas for a year or a check for $5,000. At the end of the Promotion, one lucky grand prize winner will get $25,000.00 cash. 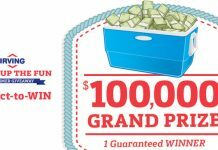 The Irving Oil Pump Up The Fun $5 Million Summer Giveaway 2017 is open to all legal residents of the Canadian provinces of ON, QC, NB, NS, PE, and NF and all legal residents of the USA states of CT, ME, MA, NH, NY, RI and VT who have reached the age of majority, as of Game Start Date, in the province or state in which they reside. The Game begins at 12:00:01 AM, ET or the start of business on June 19, 2017. The Game is scheduled to end in-store at 11:59:59 PM ET or the end of business on September 5, 2017 or whenever Game ticket supplies are exhausted, whichever occurs first. What Is 3 Months Of Texture In The McDonalds Monopoly Canada 2018? After a several attempt I didn’t get what I supposed to submit my pin. Can’t enter my pins…… Keeps telling me my email is not valid….. Very frustrating!!!!!!! Not fare!!!! Not a happy customer Irving!!!!! your site is getting crappier every year. trying to submit entries and all the space asks for is email address. HAVE A BUNCH OF HEADINGS ALL PERTAINING TO THIS CONTEST BUT AFTER ALL THE DRIVEL THER IS NO EASY WAY TO ACTUALLY ENTER THE CONTEST. I HAVE STOPPED TAKING THE ENTRY FORMS AND WILL BE GETTING MY FUEL ELSE WHERE AS THIS CONSTANT CRAP IS DRIVING ME NUTS. Last year your program was so bad my husband had to call your computer people in order to even get your program to take his email address in order to play. he now refuses to go to any of your stations Surely to goodness, the computer people should be able to put together a simple entry system for these promotions. Having a very hard time doing the correct email and address????? What’s the deal? I can not open the page to enter the pin. I choose english Canada and page does not open. After several attempts today this appears: “Fail to validate CSRF, please refresh page to continue”. Visit http://www.irvingfun.com and follow the instructions. Good luck! I can’t register my pin#’s because it says I failed to validate CSRF. What is this and how do I do it. If you are having any problems registering, entering your online PIN or if you have a general questions about our contest, please email the Contest Support at gamemaster@irvingfun.com.